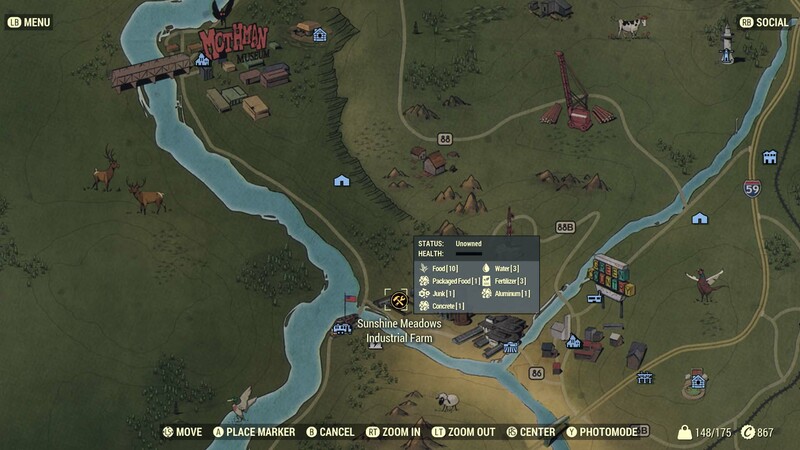 Welcome to the Noob’s Guide to Fallout 76! Glad to see you’ve all survived your 25 years locked away without killing each other, but now it’s time to rebuild civilization. We have a few tips to get you started, but first a word from Vault-Tec’s legal department. This guide may contain radiation, please use caution when reading. If you choose to follow these tips: you may become victim to bodily harm, emotional stress, or disease. 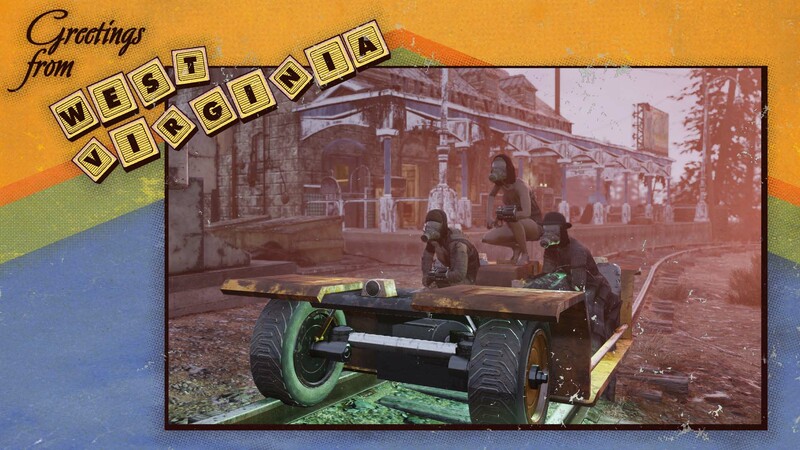 The Noob’s Guide to Fallout 76 of the Central District of West Virginia cannot be held liable for updates or maintenance to this compackage that might induce feelings of apocalyptic annihilation or mutations gained from eating improperly handled food or animal products. Reader assumes all liability in the event of accidental death resulting from the reading of this guide. So, you’re finally heading out? Don’t forget to grab your complimentary party hat, official Vault-Tec suit, and C.A.M.P. before you strike out on your own. Your C.A.M.P. will allow you to easily set up a base of operations anywhere in the world. If you forget your C.A.M.P. or you want to take your time finding a suitable location the Overseer has provided one nearby for public use. Your C.A.M.P. contains everything you need to begin rebuilding America! Simply place it down in an open area of the world and get to designing. Finding new plans will be important to help you expand your base and your selection of buildable items. You’ll start with basic knowledge in crafting and defense but will need to discover plans for things like the armor, weapons, chemistry, as well as more advanced building designs. 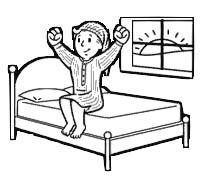 Your first option for a bed will likely be just a sleeping bag, be careful though, sleeping on the ground can give you DiSeAsEs. Plans for a metal bed can be found at the Overseer’s C.A.M.P. 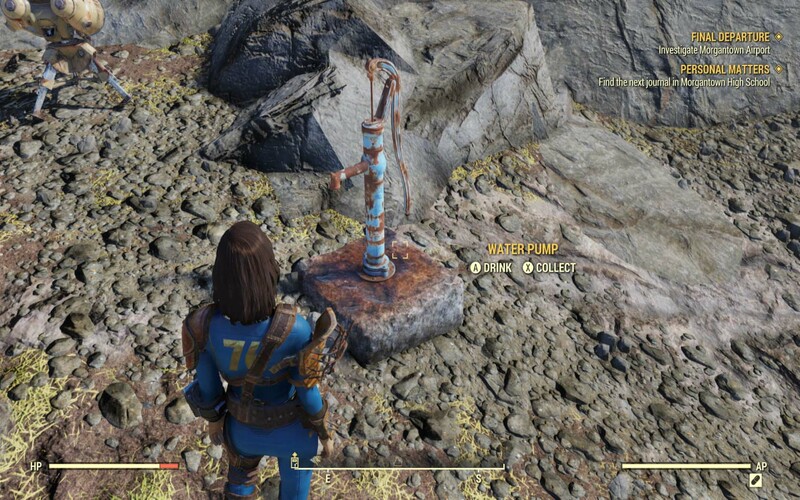 just down the road from Vault 76, be sure to pick them up! Aside from a place to sleep you’ll want a place to store your stuff! 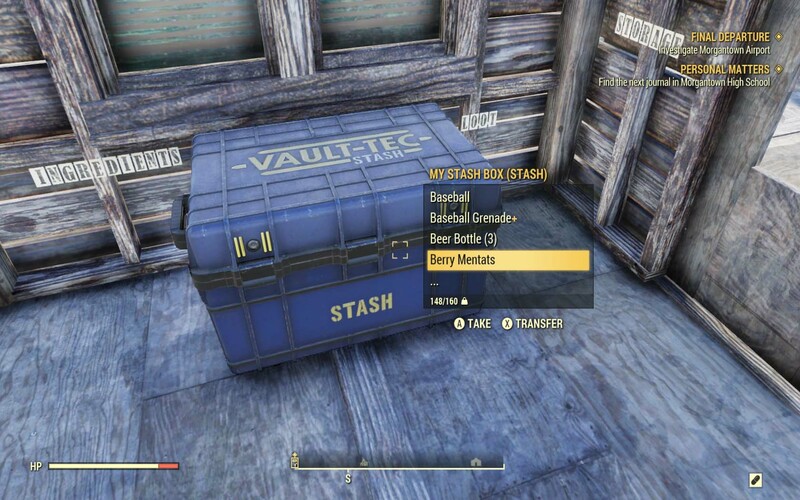 Make sure to build a Stash. The items stored in this box are unique to every player and items stored here cannot be accessed by anyone else. 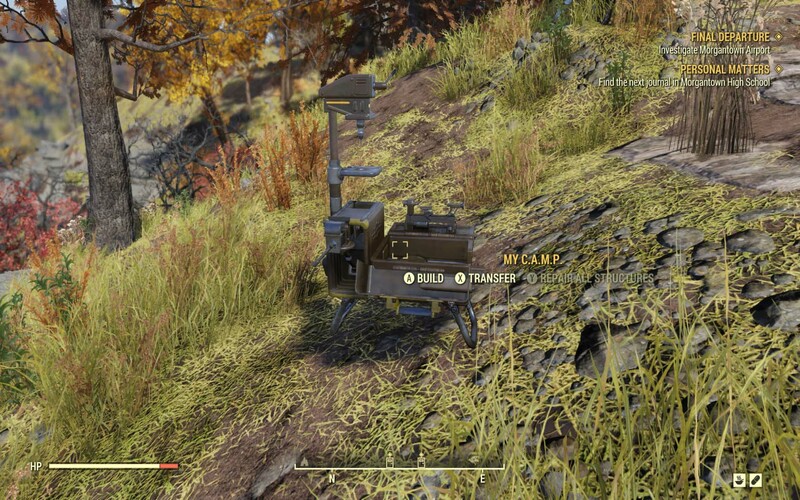 You can find other Stashes around West Virginia at places like the Red Rocket gas stations, train stations, and at the Overseer’s camp. The list goes on and on. Make sure to keep plenty of RadAway onhand to help remove the radiation you’ll be consuming. Nobody wants to party-up with the guy that’s oozing weird fluids or giving away their hiding spots because he’s glowing like a nightlight. You’ll need that RadAway handy because everything you consume will give you rads. Purified water is the only thing early on that won’t. You can get some purified water for completing missions, but your rate of consumption early game is very high. You’ll need a lot more liquid to get by. Drinking anything else, even boiled water, will up your rads. Even just pumping water from a water pump or collecting it from a river will irradiate you. Water purifiers can be crafted to use while boiling water or you can get plans for a filter that will produce purified water. I’ve heard rumors of finding one of the plans during the Overseer’s questline at the DMV. At least two of the plans require a water source in your camp, one does not, and the water filter can be used at the cooking or chemistry stations. You’ll also need power to run the purifiers, so plan ahead to keep room in your C.A.M.P. budget. As for cooking: may we suggest the soups? Soups will refill both your water and your food. Soups are easy to make once you get some corn or razorgrain growing. Blackberries, melons, and tatos make great after-nuke cocktails. If you’re not into a liquid diet you can also cook up some inspired animal-based dishes like Awesome Opossum Bacon or Deathclaw Egg Omelets. The Cooking Station can also create vegetable starch. Vegetable starch is a fantastic way to easily produce adhesive which you’ll use when repairing weapons and armor. Be sure to establish a food and water supply quickly as constantly stopping to find these things can really dampen an explorer’s mood. In a pinch, dog food can be quite tasty! You can even pick a Perk to improve your benefits from it later on. Pick. Up. Everything. No, seriously. In the early game, resources are hard to come by so looting every box, tool chest, body, and murderous robot is only to your benefit. 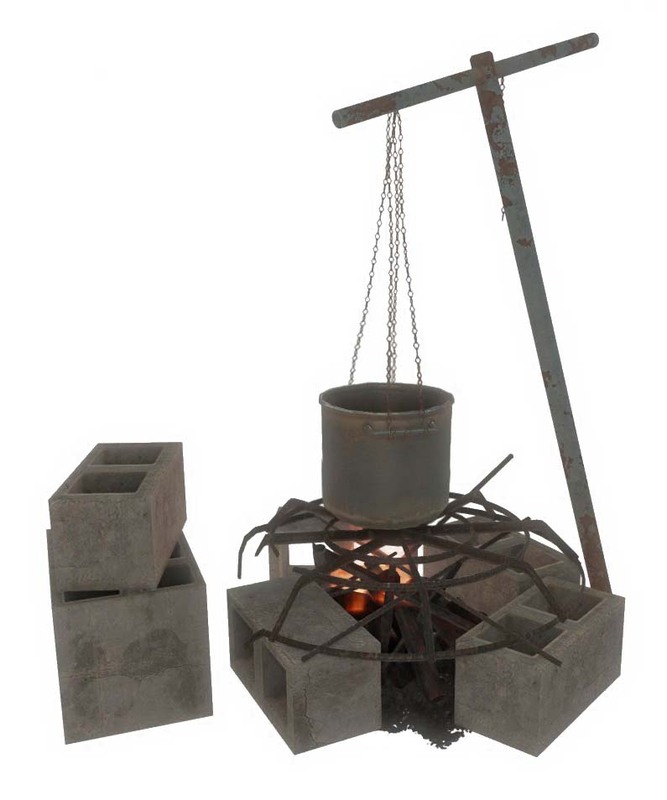 Setting up your C.A.M.P. near a building you can continually raid for supplies is hugely beneficial in your first few levels. Junk can quickly overburden you making you slow and an easy target for mobs. If you find a crafting bench while you’re looting. break down your junk as you go to help lighten your load. Weapons of a lesser quality or of a type you aren’t interested in using can also be scavenged for junk and will help you learn new modifications for that weapon type. Crafting stations help you do all kinds of cool stuff with your junk. 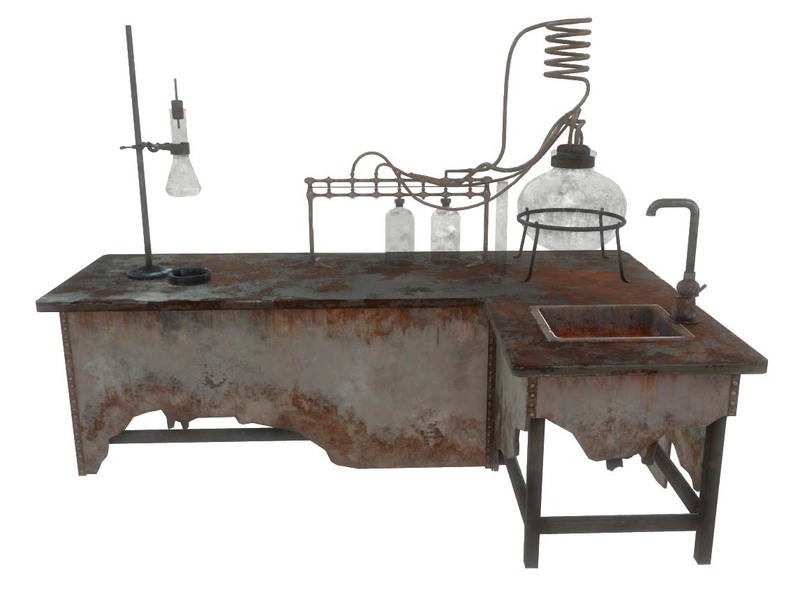 Use the Chemistry station to make fertilizer from spoiled food and the Tinker’s workbench to create ammo and explosives. You can pick Perks to help lighten the weight of different weapon types, junk, chems, food and water, and armor. Take a minute to consider what items you want to carry around with you day-to-day and go for these Perks early. Remember that if you die, you drop all your junk. Offload your hard-earned loot at your Stash as often as possible! Remember to break down (and bulk) your junk before storing it to help stave off that 600lb limit as long as you can. One last note on scavenging. Workshops are loaded with a wealth of fantastic resources. You can build extractors to pull material like junk, aluminum, lead, crystal, nuclear material, silver, concrete, and fertilizer from the ground. Hovering over a Workshop will reveal if someone owns it, what resources are available, and what the current state of its defenses are. But be warned, these can be tough to hang on to, you must defend it from mobs and other players. They also require a lot of resources to keep going. Consider waiting until at least level 10 or higher to take one of these. You may have noticed on your way out of the Vault a pack of Perk cards. These packs can be used to make you S.P.E.C.I.A.L.! As you level you can spec into Strength, Perception, Endurance, Charisma, Agility, and Luck. As you add points to these areas you can then use Perk cards to add bonuses to your survivor. As you can see above each card has a number on the top left, a letter in the lower left, and a star group in the lower right. The number is how many available points that card requires, the letter is the type of Perk (perception, agility, ect. ), and the stars are how many upgrades are available for that card. 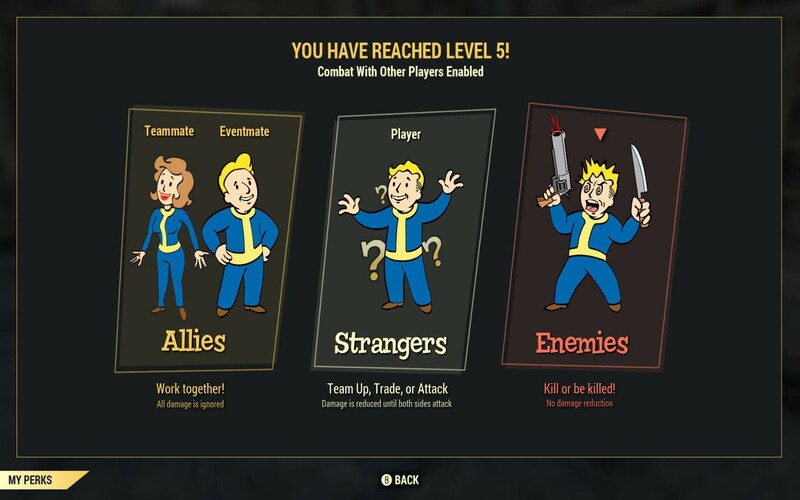 Say, if I already own two of the First Aid Perk, I could level up those three cards to produce a super Perk card with better benefits. But leveling up cards also requires greater points to equip. 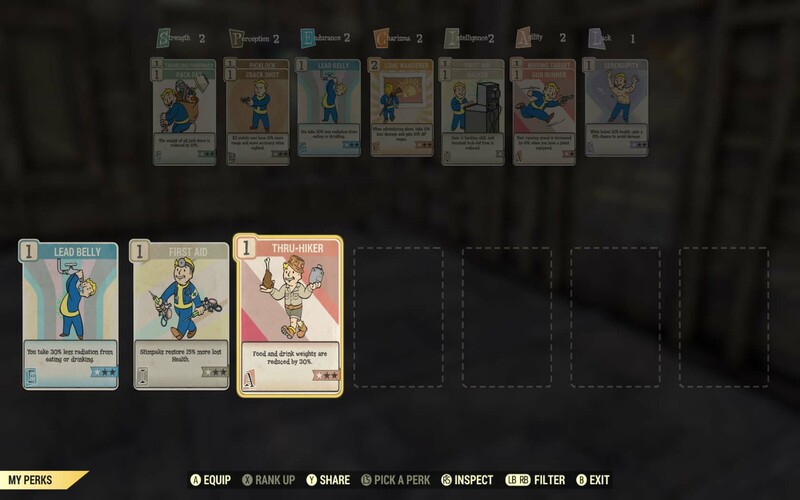 Once you’ve selected your card you’ll be dropped into your Perk assignment screen. Above you can see all the points I’ve already allocated to various areas and the cards I have assigned. My extra cards remain at the bottom for later use. I chose an agility point so I’m going to equip my new Gun Runner card into my agility slot above. Alternatively, had I planned ahead, I could have added a new point to Endurance and combined my in-use Lead Belly card with my extra one at the bottom. C’est la vie, there’s always next time. As you level you’ll gain more packs that will allow you to choose new cards. 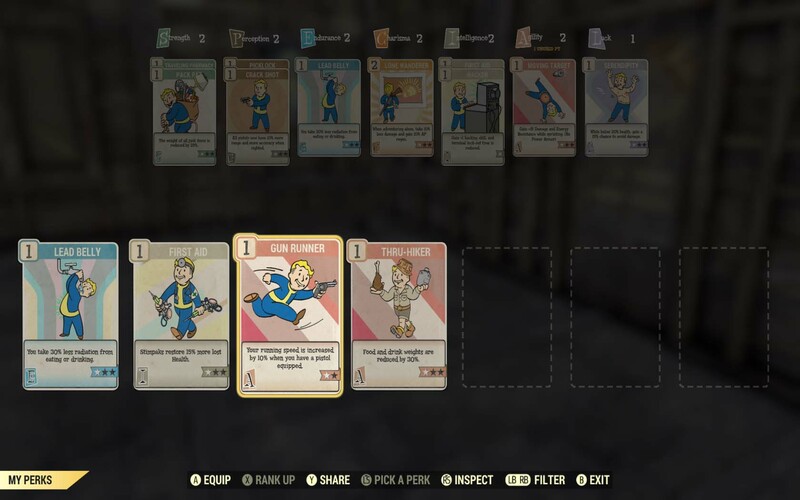 You get the starting pack from Vault 76 before you leave then another at level 2, 3, 4, 5, and then every 5 levels after that. Congratulations! You’ve reached level 5! 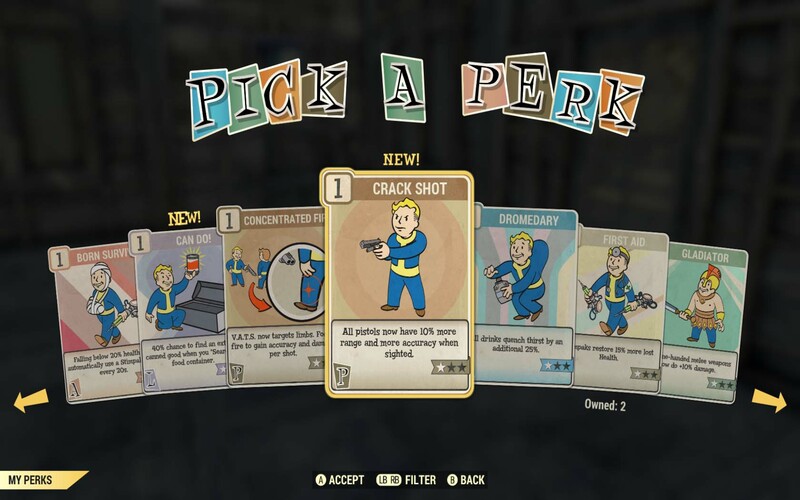 Not only do you get a new Perk Pack, you also win the opportunity to be savagely murdered by other players. Not to worry though, if you befriend some players you can also take Perks that benefit you and your teammates. You and your friends can embark on a murderous rampage, take a workshop together, or just happily quest along in complete end-of-the-world denial. Might I recommend trying out the Events with a few buddies? Events give you some cool resources for completion and are best done in groups. They do require a lot of ammo (or some fantastically talented melee moves) so be sure to stop by a Tinker’s workbench to craft some up beforehand. On our last stop in Appalachia we find nuke codes. Occasionally while wandering the map you’ll be warned of another incoming nucular strike. Simply open your map and locate the giant red circle, this will be the impact area. If you aren’t in the impact area: great! If you are: may we suggest… leaving? Once the nuke hits, every player in the area dies and the local flora and fauna become a bit more… aggressive, to put it lightly. 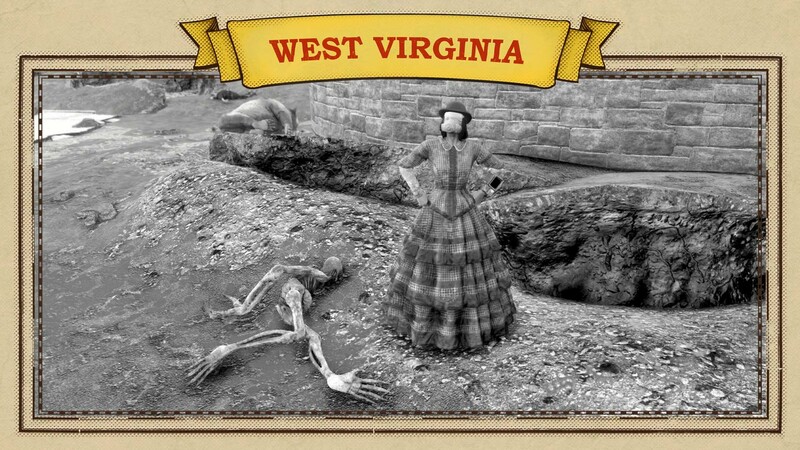 Without a hazmat suit or some power armor, you are unlikely to survive for long, if at all. Don’t be like this Vault Dweller and run in to collect some pretty blue glowing tree ooze. It’s a trap. Just don’t do it. 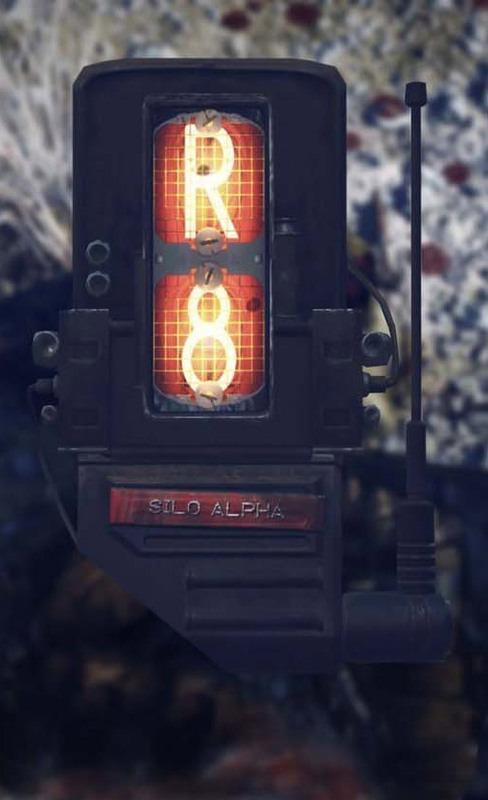 These nuke codes are hard to come by. In your travels you may happen upon a beeping noise or a flashing ghoul, these are part of your ticket to mass destruction. You’ll have to acquire a few of the drops pictured here first, then crack a cipher, and then gain access to a silo to actually launch a missle. Being an evil, post-apocalyptic wreaker of havoc has its hurdles. It goes without saying that this is end-game content. Many levels, a solid suit of power armor, a decent weapon (or five), and a lot of time is required to participate in a blast zone battle. Think more World of Warcraft raid, than stroll through Disneyland. Don’t try this at home folks… or at least here’s hoping your C.A.M.P. isn’t set up in the area when it goes off! 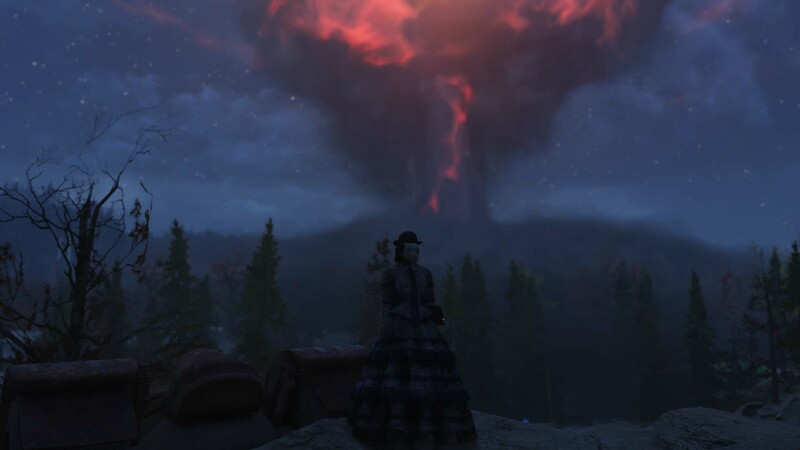 Whether you’re a homebody that likes to build, an adventurer who wants to travel the land, or intent on raiding and pillaging, well, everything; I sincerely hope you enjoyed this little introduction to Appalachia. Go wreck some Deathclaw face, survivor! Kirei is a roadmap slinging Product Strategist by day and a geek girl... well all the time. Building, surviving, and achievement getting are her passions. She moderates the Women in Geek Industry panel at Denver Comic Con, creates a slew of random YouTube videos, is a part-time Mixer streamer, and is a connoisseur of chili cheese fries. Her love of gaming extends to table top as well as D&D and Magic. @ her on Twitter all of your llama pics. Nice guide! The boyfriend bought and already beat Fallout 4, so I think I might start there first.